Come i conflitti del 1918-22 hanno forgiato l’Ordine di Versailles e l’Europa di oggi - How the conflicts of 1918-22 shaped the Order of Versailles - and today’s Europe. Novant’anni è una lunga età per l’uomo. Gli eventi che sono accaduti intorno a quel periodo tendono ad essere dimenticati nel presente, specialmente quando essi fin dai loro giorni, erano oggetto di critiche severe. Novant’anni fa il 28 giugno 1919 è stato firmato il Trattato di Versailles ed è cominciato il definitivo declino dell’Europa. Ma possimo semplicemente non considerarlo e pensare solo ai problemi di oggi ? La sfida dell’allargamento all’Europa dell’Est richiede uno studio attento del processo di costruzione delle nazioni in questi paesi immediatamente dopo la Prima Guerra Mondiale. 90 years is a long man’s age. Events that happened beyond such an age tend to be forgotten by the present, especially when they were, since their early days, an object of severe criticism. 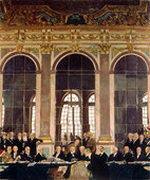 90 years ago, on 28 June 1919, the Treaty of Versailles was signed and Europe’s definitive decline began. But can we just push this aside and think of our present problems? The challenge of EU enlargement to the East requires an attentive study of the nation-building process in these countries immediately after World War I. Some time around 1919 Winston Churchill commented the international situation of that moment, saying that "the war of the giants had ended, the wars of the pygmies began". It had soon become obvious that the armistice, signed on 11 November 1918 in the forest of Compiègne, had not brought peace to Europe. The enourmous manslaughter on the battlefields in northern France and Belgium as well as in northern Italy had found an end after four years of total war, but in other parts of Europe war kept on raging or broke out while in Paris a huge conference tried to find a general peace solution for the whole continent. Another four years had to go by before a situation of general peace was finally reached - not decreed by treaties, but as a result of warfare. Maybe it is a problem of perception: all historical debate in our western European countries has allways focused on the peacemakers in Paris and their decisions, right or wrong as they were, as the main origin of the tragic events that happened within a generation from there: the economic crisis of 1929, the rise of totalitarian regimes, World War II and the holocaust. Germany was at the center of these events and so the treatment this defeated nation had to undergo in Paris became the key of interpretation for the understanding of the subsequent era, which many historians see as a mere period of ceasefire in an ongoing European Civil War. But if it was not the Treaty of Versailles and the other Paris suburb treaties (St.Germain-en-Laye, Trianon, Neuilly, Sèvres) that shaped the fragile and, as a consequence, failing order of the next twenty years in Europe, what "made" the new Europe? And what about the real role France, Great Britain and the USA played in the establishment of this order, if the Treaties negotiated and decreed by them were not the determinating element for it? In the introduction to his book "Cataclysms", Dan Diner takes an unusual point of view for the interpretation of Europes history in the Twentieth Century. His observer is in Odessa, on the Black Sea coast, on Europe’s edge, and looks first on the countries closest to him: Ukraine and Romania, then in a wider circle on Bulgaria, Greece, Yugoslavia, Hungary, Poland and Russia, even farer away are Germany, Austria and Italy, and finally France, Great Britain and the USA are almost out of sight. What does Diner want to say with this image? The center of European affairs for him is not somewhere between Paris, London and Berlin, but between Bucharest, Kiev and Warsaw, eastern Europe was the playground of the entire continent’s destiny in the decisive period of 1918-22, when the wars in this area shaped the new Europe - and a paralyzed Paris could only acknowledge and write into Treaty forms what weapons had decided elsewhere. The most important war in these years was, of course, the Russian Civil War; and the absence of a Russian representation with sufficient negotiation power in Paris was perhaps the decisive element that made the whole Peace Conference obsolete. And not only the absence of Russia was decisive; on the Vienna Congress in 1814/15, all important European powers had been present, and the order it had shaped had persisted for almost a Century. In Vienna also the defeated nation, France, had been invited to participate, and was able to obtain an honourable place in the concert of powers; in 1919 Germany was not invited to take part in the Paris negotiations, and the subsequent new "concert" even more turned out of tune. With Russia at war and threatening to spread social revolution over other parts of the continent, the western allies had raised Poland and Romania to pillars of an anti-bolshevik bulwark. To both countries they were ready to grant their ambitions on national self-determination; Romania would receive parts of Transsylvania, the Bukovina and Bessarabia; Poland would be rebuilt in frontiers corresponding to territories with dominantly polish population, roughly the areas of the so-called "Congress-Poland", a polish heartland integrated in 1815 into the Russian Empire, but including some pieces of Germany and the Austro-Hungarian Empire. But this bulwark soon became aware of its real power in a vacuum situation surrounded by collapsed Empires and exhausted World-War-Winners, unable to defend them against the bolshevik threat and to impose limits on their will for expansion. The history of the allied military missions all over eastern Europe symbolizes the effective impotence of France and Great Britain, also due to the growing conflict amongst them, and the lack of will by the United States to impose the Wilsonian ideals for Europe with the necessary tools of "physical" power. Romania had started a war against newly independent Hungary on 10 November - one day before the armistice of Compiègne - and pursued the conquest of Transsylvania up into 1919. When a communist regime took power in Budapest trying to save Hungary from disintegration and hoping for support from Russian bolsheviks, this was an ideal pretext for Romania to cross the demarcation lines set by the western allies and invade the whole of Hungary. In the Treaty of Trianon, the Romanians obtained a much bigger part of Transsylvania including areas with a majority of magyar population, then the western allies had initially forseen for their eastern partner. the south-eastern pillar out of control. The most remarkable fact in this conflict is that the Allies had been ready to deal with the Bela Kun regime, though it represented the two enemy souls of the moment: it was a defeated country of the Great War, and it was communist. This shows how unable the Allies were to control their own south-eastern security pillar, Romania. Likewise, Poland sought to anticipate decisions of the Peace Conference, inciting and supporting militarily an insurrection of the polish population in the Prussian province of Poznan by late 1918, and obtaining its de facto integration into Poland in February 1919 (the so called "Greater Polish Uprising"). 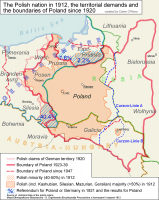 The Treaty of Versailles would have granted the province to Poland anyway, and, by then, even the province of West-Prussia, in the north of Poznan, with its much discussed access to the sea near Danzig, was to be handed over to the Poles. 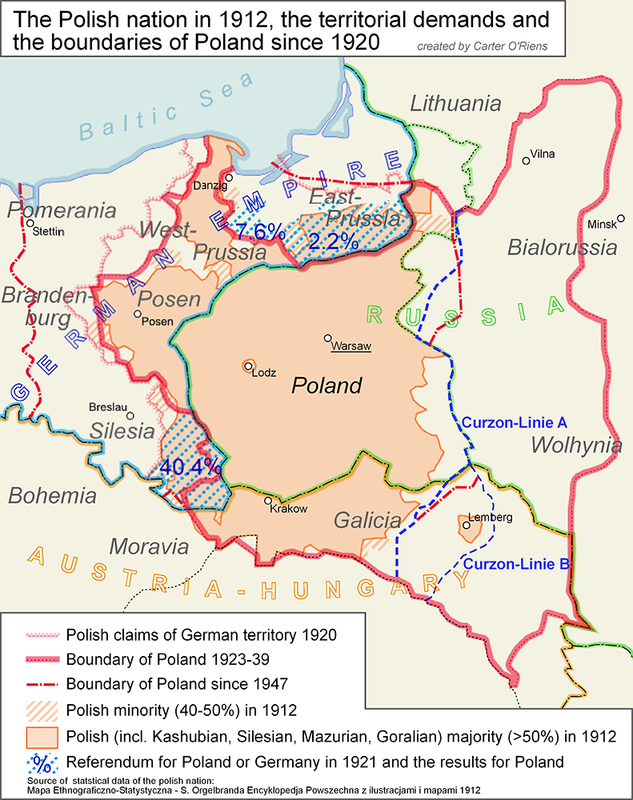 But in the occasion of the Poznan uprising the Polish saw that the allies were not willing to stop violent expansion and consequently, at the Peace Conference, claimed the reestablishment of their borders of 1772 - including Lithuania, Bielorus, half of Ucraine with Kiev, and Galicia - as a minimum request. Only by late 1919 the perplex peacemakers in Paris sought to propose an eastern borderline for Poland, inspired by ethnic principles, the "Curzon-line". But the fate of this proposal showed their awkwardness in east-European affairs: the war between Poland and bolshevik Russia couldn’t be stopped; as long as Polish forces were successful and penetrated into Russian territory, the Curzon-line was nothing more than a drawing on a map somewhere in Paris. And this didn’t change when the tide turned by mid-1920 and the Red Army advanced into the Polish heartland. Now Poland sued for respect of the Curzon-line, but in vain. After the successful polish defence of Warsaw, it was exhaustion on both sides, but especially among the bolsheviks, that stopped the war. The borders established with the Treaty of Riga in 1921 were quite different from the ideas circulating in Paris. Historians today mostly agree upon the assessment that the Polish-Soviet War "largely determined the course of European history for the next twenty years or more..." and that "...Unavowedly and almost unconsciously, Soviet leaders abandoned the cause of international revolution" (A.J.P. Taylor). It seems to be the efficient Polish resistance that has saved Europe from bolshevism. In public knowledge, however, the importance of the event even for our times is still completely underrated. Some "would have beens" - usually hated by scholarly research - might show this: would the Soviets have won the battle of Warsaw in August 1920, eastern Europe would have been invaded by bolshevism and the Red Army probably stopped only somewhere in the middle of Germany by hastily re-mobilized Entente forces with US-support. The Cold War szenario was quite realistic already in 1920, including a German separation in East and West. Such a separation of Germany in two parts was a much discussed option even without the scenario of an invasion by the bolsheviks. 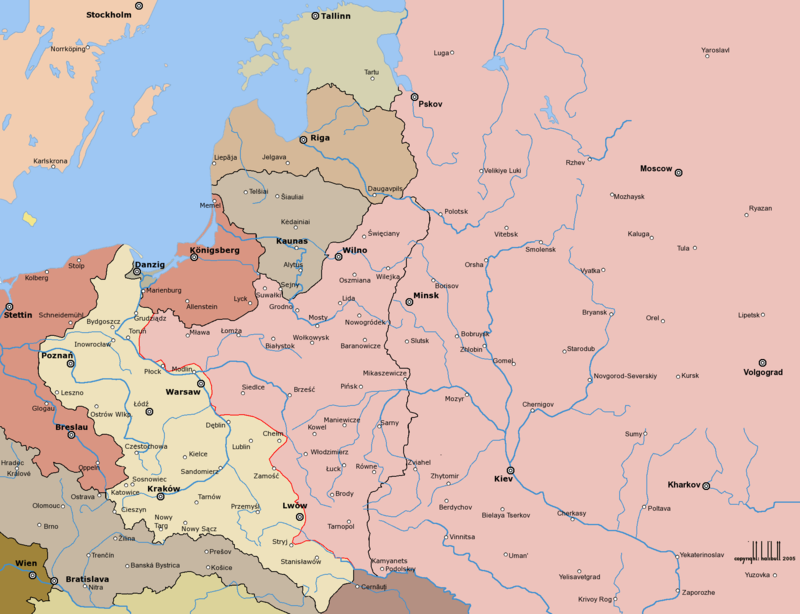 In order to understand why, we have to consider that the Germans, after the Treaty of Brest-Litovsk in March 1918, had occupied the whole Baltic region, Belarus and Ukraine. Article 12 of the armistice of 11 November 1918 had established that the German troops should retreat from these lands only when "the Allies, taking into account the internal situation of these territories, shall decide that the time for this has come." In other words, France and Great Britain admitted that they had no means to impose their rule in eastern Europe and, confronted with the alternative to leave these countries to an easy bolshevik conquest, they preferred using the defeated Germans as bulwark for their political purposes, allowing them to play a somehow active role in the settlement of east European affairs. 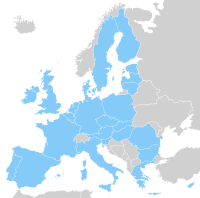 Article 12 divided Europe in two zones: a peace zone in the west and a war zone in the east. In the west, Germany had to obey to the law of the Allies; in the east, however, some of the German military and political leaders perceived a space for autonomous action in order to make some pressure on the Allies and gain more favourable peace conditions for Germany. The organization of a spontaneous defence against the Greater Polish Uprising in Poznan in February 1919 showed that action was possible without running into direct counteraction by the Allies. The question whether or not to accept the peace negotiated in Paris not only set the new republican "Weimar" government in front of a national dilemma, but also risked to provoke a separation of east German lands, roughly corresponding to what had been 18th century Prussia, from the Reich. Especially after the presentation of the first draft of the Treaty to the German delegation in May, important military and civil leaders in these territories campaigned for the creation of a separate east German state, independent from the government in Berlin, in case it would sign the Treaty. Acting independently for a while, this eastern state could become the heart of an general German resurrection and later on reunite with the western part, to overthrow the regime of Versailles. Those plans were further favoured by the action of the Freecorps in the Baltic region. 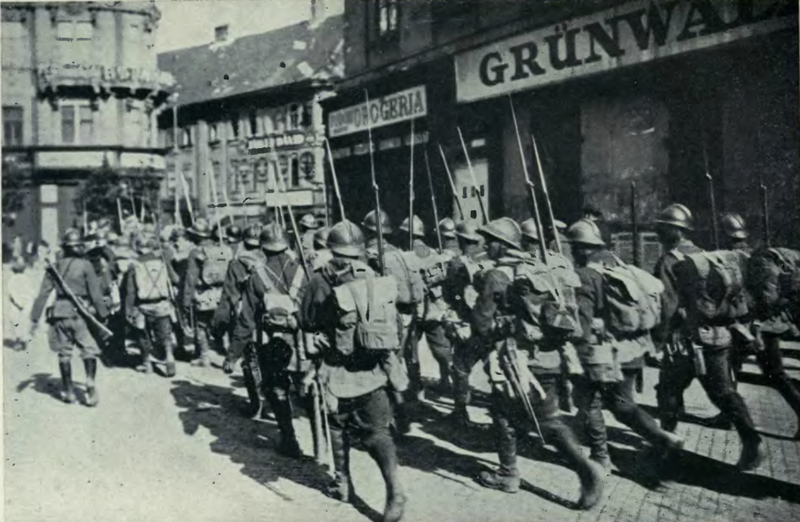 These troops, detached from the regular German army and acting in a more or less autonomous way, without regard of the orders by the German high command and the Berlin government, had taken over control of the Latvian independence forces in early 1919 and then managed to free the city of Riga from bolshevik occupation - to the great embarrassment of the Allies, who had not been able to stop the advancing Red Army. Everywhere in Germany desperate volunteers were recruited to whom was promised, in change for service in the Baltic Freecorps units, a piece of land in a new German Baltic Duchy. This new state may have even united with the east German separate state, creating a new powerfull element in eastern Europe. In the end, all these plans revealed to be unpracticable in a country weary from four years of heavy war and suffering from hunger and economic downfall. By the end of 1919 the last German forces had withdrawn from eastern European territories and also the Freecorps had retreated to the inside of German borders, transporting with them their angriness about a missed opportunity, as they saw it, for German resurrection. The failed Kapp-Putsch of March 1920 was a striking expression of their state of mind. In fact, many of the idealists of an east German separate State and a German Baltic Duchy were to become Nazi hardliners few years later. If the Allies had, in the end, subdued Germany at its governmental level - the supporters of the Weimar Republic - they had completely underestimated the real driving forces of interwar Germany, forces that saw the nation’s fate in the east. And there, the Allies had to recognize their complete impotence, despite military missions in Warsaw, Belgrade and Bucharest. Though, what ruined most their credibility as winners of a World War, was the failure of their intervention in the Russian Civil War. From the beginning in June 1918, the intervention by British, French and US troops was more than half-hearted and had no impact at all on the outcome of the war. For bolshevik propaganda, however, it was a perfect pretext to denounce the imperialist character of the Entente powers and to startle russian national feelings, showing the communists not only as one party in an internal struggle, but as only defenders of the nation, while the ex-tsarist "Whites" were collaborating with the enemies of the nation. 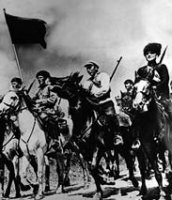 Bolshevism revealed to be the reincarnation of traditional russian nationalism and what really galvanized the masses of the working class and peasant population was - perhaps even more than the hope to be liberated from their miserable living conditions - the circumstance that they finally could identify with their nation. Twenty years later these masses could be mobilized by Stalin for a "Great Patriotic War", once more fighting invaders of the nation, but not for the defence of communism. Finally, in the 1980s communism could even collapse, but russian nationalism survived. The Paris Peace Treaties, after the failed Allied intervention in Russia, simply spared out any solution for that country, waiting for the end of the Civil War and the establishment of a government that was able to control the whole of Russia. Already in 1920 Great Britain started looking for cooperation with Soviet Russia, though in vain - and France’s refusal to do the same was punished in 1922 when Germany, in the Treaty of Rappallo, reestablished ties with its former enemy, transforming the "negative alliance" of Brest-Litovsk into a positive agreement and preluding the fatal non-aggression-pact of 1939. The last of the Paris suburb Treaties, the one signed in Sèvres, was perhaps the most symbolic in terms of irrelevance for east and south-east Europe. It was intended to grant Greece and Armenia huge territories out of the Ottoman "graveyard", but didn’t consider at all the existence of a lively Turkish nationalism. While shortly afterwards Armenia - whose population had already been victim of genocide in 1915, in recompension for which it had been awarded a huge territory in Asia Minor - completely disappeared between Turkish and Soviet nationalisms, Greece was to engage in a war with the Turks to which it had been encouraged by Great Britain - only to be left alone by it when the tide turned against the Greek forces in 1922. In 1923 the Treaty of Lausanne reversed Sèvres, and for the first time in contemporary history sactionned the practice of ethnic cleansing as a solution for national conflicts: 1.5 million Greeks had to leave Asia Minor and 0.5 million Turks were to be evacuated from Thrace. The human suffering in this population exchange with tens of thousends of dead on both sides was forseeable. And the example was to be imitated quite often throughout the century. In World War II Germany and its allies practiced ethnic cleansing of minorities up to extreme consequences, but also the Balkan wars of the 1990s and the Caucasus conflicts up to our days just repeated what had been rubber-stamped by the western Allies. The Jews in particular were effected by the minority problem. 8 million lived in the so-called "Pale of Settlement", roughly encompassing Ukraine, Poland and Bielorus. The Jews had expected the Paris Peace Conference to give them their national home, as promised by the Balfour-declaration in 1917. 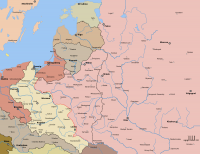 Instead the Pale, united inside the multinational Russian Empire as well as in the likewise multinational German occupation zone after Brest-Litovsk, was divided in various parts. And the Jews, united in the Pale, became various small minority groups in new nationalistic countries, which were barely inclined to respect the minority clauses of the Paris Peace Treaty. As a consequence, during 1918-22 Jews became victims of numerous pogroms and massacres perpetrated by nationalistic groups of Poles, Ukrainians, Russians or else. Since the Jews had discovered themselves a nation without a territory, they had become victims of nations who had a territory, in which they were constrained to live until their national home would be built up in Palestine - a land part of the Arabic nation. The Order of Versailles, in the end, was created everywhere but in Versailles; it was created in Warsaw, Riga, Budapest, Bukarest, Kiev, Ankara, Rapallo and Lausanne. If Versailles was to implement the principle of national self-determination, this principle soon turned against the peacemakers and gained an own dynamic. This dynamic lead to World War II and was barely overshadowed by the ideological conflict of the Cold War, because reasons of economic defense and expansion mostly met with national interest. When the veil of the Cold War scenario disappeared, national interest remained uncovered and visible to everyone. And the European Union? Needless to point out how reluctant the member-states still are to create real supranational organisms and give up sovereignity rights. National interest still dominates in Europe. After the plans for a Political Union that failed in 1953, no serious attempt to unify the European Union politically has been made. To do this, Europe has to overcome the idea that national identity is the constituent factor for state-building. Europe as a state, that would be the return of multinationalism, as it had existed in the Great Empires until 1917/18. Their destruction was the triumph of the national state, especially in eastern Europe; the final entry of these eastern European national states into the European Union might be the beginning of the end of the Order of Versailles. But till now, this new multinationalism has only motivations coming out of economic and defensive reflections. A positive political unity and identity of the enlarged Europe is still missing - as it was missing for the smaller Europe before. The Order of Versailles is still in power.